Whose Madness Is It, Anyway? The Supreme Executive Committee has been made aware of something called “Papal Madness,” an effort to suggest an alternative for electing the successor to Pope Benedict XVI. In this so-called Papal Madness scheme, or should we say, schemes, brackets would be used to choose the Vicar of Christ. You can see the problem. The Papal Madness people have stolen our idea. There is only one Madness right now, and it is Lent Madness. We expect a profuse apology any moment now. If only they had asked, we could have helped them. After all, doesn’t it make sense that the Supreme Executive Committee would be involved in the selection of the Supreme Pontiff? We also note that Benedict has decided to retire on February 28, the day that Benedict of Nursia enters the playing field of Lent Madness. Is the Holy Father setting aside the papal crown in order to lobby for the Golden Halo for his namesake? Or is the Pope planning to devote his time to campaigning for Gregory the Great, the only pope in the bracket this year? Only time will tell. For now, it is enough for us to cry foul at another entity trying to ride our coattails. Lent Madness was created before the papal pretenders got into the bracket business. Until they repent, we declare a bracket anathema upon them. And we are considering unleashing the Lent Madness Legal Team upon their heads. We have to draw the line. Otherwise, what’s next? Announcing the election of a new pope with purple smoke? 36 Comments to "Whose Madness Is It, Anyway?" I love this Lent Madness! It is wonderful to laugh and to have this be a part of my Lenten journey. LOL at this posting! Has the SEC forgotten that it borrowed the bracket concept from a little college basketball event called “March Madness”? From Fr. Scott, I can believ that. I’m looking around for a “Like” button on this comment. Lol! My son-in-law told me the same thing….it started with March Madness, a sports bracket. There is but one, true Lent Madness! Don’t worry, I’m sticking with y’all. I’m not even drafting my Fantasy Baseball Team until Holy Saturday! As long as the vote is fair, I vote for EVERYTHING! I’ve voted for saints, and now Popes. POWER TO THE PEOPLE!! God knows what’s going on. ‘Nuf said! Great posting! Am still laughing. I am going to suggest the bracket method for when a parish I am “acquainted” with calls a new rector! Never being one to pour gasoline on the fire it is with some reservation that I tell you of yet another site called Pope Madness, not to be confused with Papal Madness. Pope Madness gives odds on the various candidates and has the brackets broken down geographically. It seems that the SEC’s Lent Madness is spawning hosts of imitators. Perhaps a double anathema or something even worse will be required to restore sanity, or perhaps insanity, to this whole process. Is the Big Board in ‘Vegas far behind? Next thing we will see is the SEC in shades! Sorry, Mort, I didn’t see your comment before I posted mine! Imitation in the most sincere form of flattery. What’s next? Ordaining women. Recognizing a gay pope.? I don’t think the Pope wears purple (sounds like a bad joke). Doesn’t he wear red? And white–maybe that’s why there’s white smoke. Caring for creation: A significant number of air miles would be saved if all the cardinals could vote by this system instead of attending a conclave in Rome. Uh…Oh !!!!! You guys are gonna get it now! You’re gonna be sent straight to hell in a handbasket by legions of Catholics furious at you for messin’ with the Pontiff and casting aspersions on the Church (Never mind they’ve been besmirched ad infinitum). Can’t wait to see the fireworks! 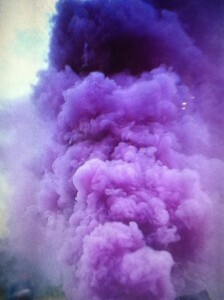 copy Catholics, but i do like the idea of purple smoke even though the SEC gave them the idea! I was prepared to like Papal Madness, but the list of contenders makes the BCS system look rational. I’ll stick to Paddypower.com for the papal bookmaking and Lent Madness for bracketology. What if lay Catholics could vote to elect the Pope ? Would that totally remake the entire church or what ? Maybe they should let the masses of the church vote on Facebook for the next pope? Works for Lent Madness, why not the church. They could change the name to Papal Bingo & have done with it. Surely no one would argue to that title. Can they really call it madness when we all know that the winner will be an older man,probably European. With Lent Madness it could be a man or a woman, and possibly someone most of us never heard of before Ash Wednesday! I have a hunch someone will soon pitch a reality TV series along the lines of Real Pontiffs of the Vatican City with lots of intrigue and batting about of miters. The smoke will simply be sweet, heavy and brown. LOL! The Joy of the Lord is my Strength! Thank you for all of this. Okay…let’s just all get along here. 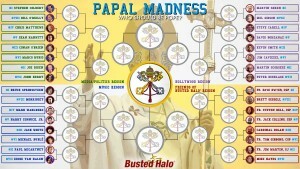 First there was THE bracket: March Madness….then this Lent Madness…now here’s Papal Madness. If anyone should be indignant, it should be the NCAA. Let’s just agree that there’s enough “madness” in the world to go around. Peace out! Thank you so much for the daily dose of humor. Sorely needed in today’s dire world. 1 Trackback to "Whose Madness Is It, Anyway?"